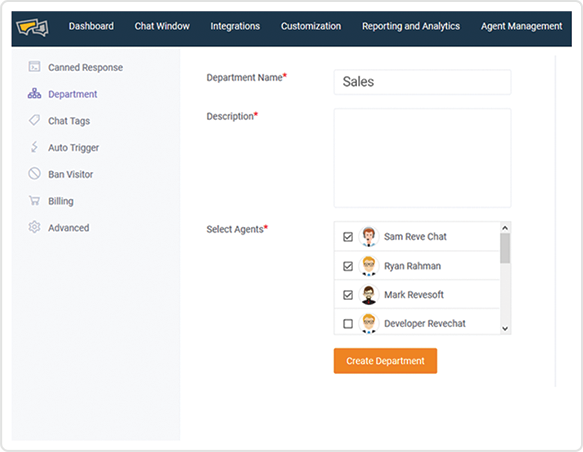 Deliver omni channel customer service with REVE Chat’s live support chat software. Provide live chat assistance to your website visitors to convert them into leads and sales conversions. 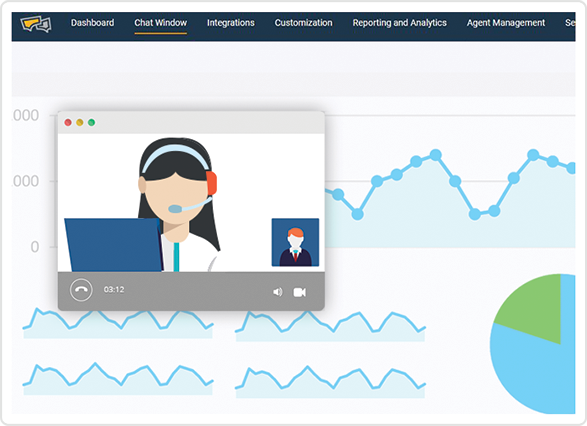 Make sales demos effective with face to face video chat and improve sales engagement. 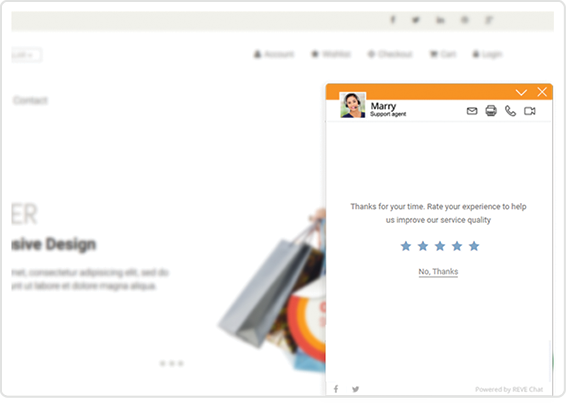 Co-browse with your website visitors in real time for your sales, support, marketing or product onboarding. Interact with your customers screen to get first hand view of the customer problem and provide instant resolution. Escalate your business growth with co-browsing technique. Connect and engage with your customer’s screen to help them in real time. It also enhances your customer service management. Develop a healthy relationship with your customers and make conversations meaningful with voice and video chat. Connect directly with your customers on your website and apps as there is no need to install or download plugins for them. Customers are most important promoters for product and services. Customers share their valuable opinions via ratings and reviews that level up their products or services and strengthens brand engagement. 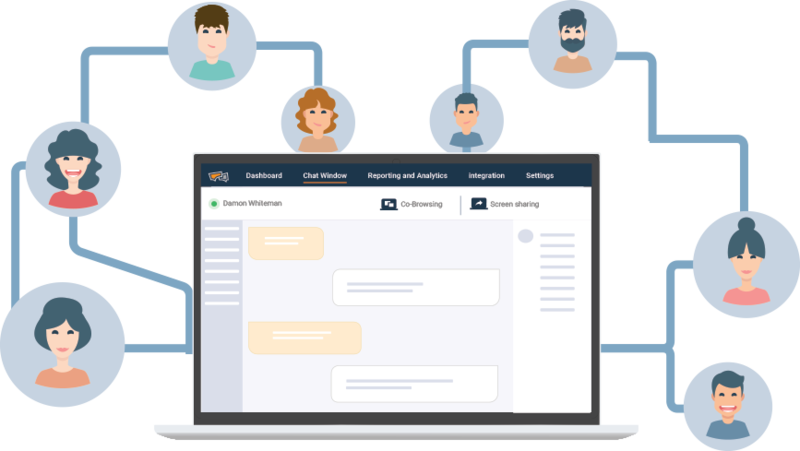 Provide social messaging support across social media and messaging apps under a single platform with REVE Chat’s multi channel live chat solution Link your Facebook, Viber or Skype bots to streamline communication with your customers. Manage your live chat support and social media customer service on the go. with REVE Chat’s mobile apps, available on iOS and Android platforms, your team can deliver instant assistance to your website visitors and customers anywhere anytime. 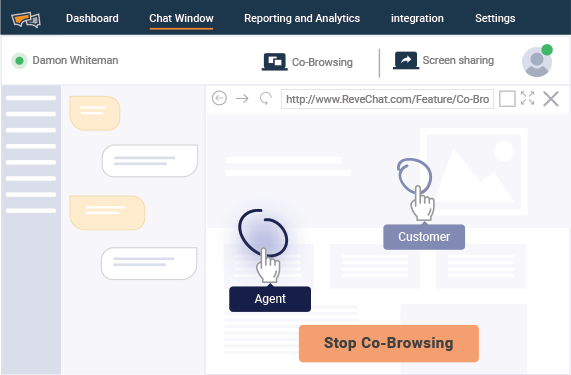 With REVE Chat, businesses can provide live chat support to website visitors and customers on websites and inside apps in real time. You can also customize live chat widget to match your branding and website theme to personalize your web conversations. Collect real time feedback from the visitors to your website that will help you to learn their requirements and problems instantly so that you can guide with authentic information and relevant solutions. Communicate with your customers virtually providing the support teams more personal, effective phone support within various omni channels. The support service should be highly scalable. Implement the co-browsing technology that allows agents to handle customer queries efficiently. 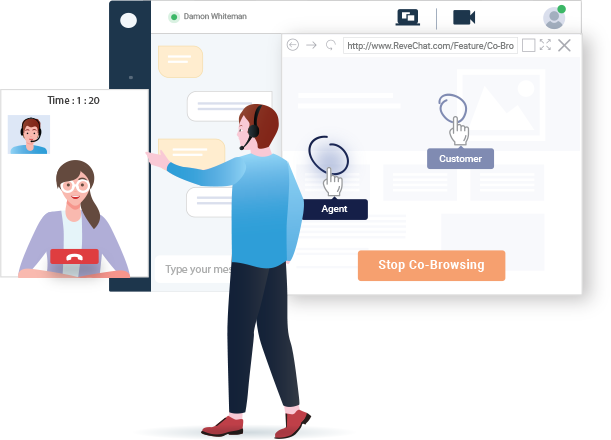 With co-browsing, the agent can instantly view and connect with the customer web, resolve the complex issues in the first communication, and save time. Customize your live chat widget that matches closely to your website branding. Welcome visitors with a customized greeting that engages the efficiently and provide better live chat experience. Improve the productivity of your sales and support with the live engagement tools. Deliver a better customer engagement by handling customer queries in real time. You can handle the specific domains that are certified for chat conversations. Access is restricted to the unauthorized domains. Save the responses for frequently asked questions by the customers and use them during the chat conversations. Make conversations effective by raising chances of sales and reduce handling time. Send a customized message your website visitors based on the customer journey that provides insight about their interests and behavior. Hitting right message at right time provides better customer engagement. In apps chat with REVE Chat’s Developer API deliver better customer engagement and improves sales conversion. REVE Chat’s live chat support tool. Implement the latest co-browsing technology that allows agents to handle customer queries efficiently. With co-browsing the agent can instantly view and connect with the customer web, resolve the complex issues in the first communication and save time.